Who hasn’t ever dreamed of living in a penthouse apartment? For the views alone, a flat on the top floor of a city building is tempting, even if the price is far less so. Penthouses are also known for their luxury appliances and frequently large outdoor terraces. But whoever invented the penthouse clearly never visited Paris, where life at the top takes on a whole different meaning. If you’ve ever visited or lived in Paris, you might have experienced staying on the last floor of a walk-up building. In pre-elevator days, the wealthiest Parisians lived on the prestigious lower floors of a building, and the hired help inhabited the upper levels – no one who had a choice wanted to climb stairs. But the highest floors give you a personalized Parisian skyline: chimney tops any way you look, lazy twirls of smoke still puffing out of some of them, even though it’s finally starting to warm up here in Paris. Or you get a view of the late afternoon sunlight reflecting hazily off the round cupolas of the gorgeous Haussmann-era buildings. At different times in my life here in Paris, I’ve inhabited what were once maids’ rooms: a few of them joined together makes an almost respectable apartment. But the most rudimentary place I lived in was retrofitted with “luxury” amenities like a sink, and the place got both stuffy and steamy in summer since the apartment was under the mansard roof, just under that burning zinc. Once, I remember opening my window to find pigeons invading the gutter which ran just below the sill: they were feasting on breadcrumbs. Looking right, I realized that the sink in my room drained directly into the gutter through a tiny pipe inserted into the mansard roof, and that the breadcrumbs had gone down the sink: they were left over from my own lunch. If you can bear the few-daily climbs to the last floor, you get to live a life slightly more free of pollution, of street noise, and, if you’re on the very top floor, of the clatter of upstairs neighbors’ activity. But the prospect of lugging over-stuffed baskets or even a fancy triple-wheeled chariot up five or six flights of stairs gives new meaning to the market list, since who wants to just pop back down for a forgotten bunch of parsley? Everyone has their own style of attacking the climb to the top: there are the stompers, their pace on the steps pounding and rhythmic. They approach my floor in a crescendo, and then with a shuffle across the landing, they continue their cadenced trajectory upwards. But there are also light steppers, whose feet must have feathers or rubber soles, like the ones on those roundish Campers people have been wearing for years. And then there are those Parisians who actually skip steps going up, punctuating their boundless energy with a great clack! of the apartment door upon arrival. Having had an extremely short-lived period as one of those exuberant stair-skippers, I eventually cut out the foolishness and took things more slowly, inspired by the techniques of my older and wiser Parisian friends. Living on the highest floors inevitably leads to inviting friends often, especially in winter, rather than braving the cold outdoors, and then – to add insult to injury – the stairs, at the end of the evening. But not venturing out also means making do with whatever is tucked away in the liquor cabinet: a dusty bottle of cheap Armagnac, or a dispiritingly full bottle of Marie Brizard or Get 27 (it rhymes in French – jet vingt-sept). As for those founts of energy who grow dizzy skipping up the stairs at blinding speed, day after day, more power to them. I’ve decided that taking the stairs to the top is one of those necessary acts which deserves transformation, thereby creating some – a task akin to doing the dishes – meditation through suds. To my mind, the stairwell serves as a buffer between my home and the rest of the world: it’s a place to decompress. So even though I live on a low floor now, when I arrive in my building, I grab the smooth, wooden banister, step up onto the first concave wooden tread, and… breathe. This drink was born of one evening’s crippling reluctance to stray from my shared sixth-floor walk-up apartment, and of the subsequent adventure in pillaging the most sorry-looking liquor cabinet the 20th arrondissement has ever seen. But the one saving grace was a bottle of cranberry juice we had bought, shortly after the product was mercifully introduced to the French market. And so it was that my roommate and I began our wanton mixing. If you’re feeling adventurous, you might try a different herb like rosemary in place of the mint. Armagnac strikes a slightly rounder note compared to Cognac, which is also from the southwest of France. If you’re wondering how to use Armagnac or Cognac in the kitchen, look for recipes that contain other typically southwestern French ingredients: goose, duck, foie gras, walnuts, or prunes. Otherwise, but only if it’s good-quality Armagnac, keep it on hand in the liquor cabinet for after-dinner digestifs. 1. Roughly chop four of the mint leaves. 2. Combine them, with the sugar and water, in a small saucepan and bring to a boil. 3. Stir until the sugar is dissolved, and remove from heat. Let this mixture cool completely before using – at that point, the mint will have imparted to the syrup its flavor and scent. 4. Chill six cocktail glasses. 5. Fill a shaker (or any container with a tight-fitting lid) with all ingredients except the remaining mint, and shake vigorously. 6. 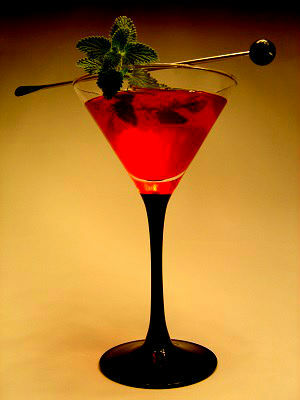 Pour through a strainer into chilled glasses, and garnish with the rest of the mint leaves. If you like, serve in 4-oz. martini/cocktail glasses, or use any fun(ky) glasses you might have around.